Why did you choose a preschool as the backdrop for a story about grownups? I think the preschool years are an intense – and often comedic – crucible for parents. The vulnerability of allowing others to influence your child for the first time, the introduction of competitive parenting into your previously insulated world, the constant fear of “doing it wrong” when the stakes feel so very high – the preschool world introduces a whole new array of formidable pressures onto adults who are already sleep-deprived, highly caffeinated, and afflicted with their own pre-existing insecurities, neuroses, and character flaws. To me, that makes for a target-rich storytelling environment. 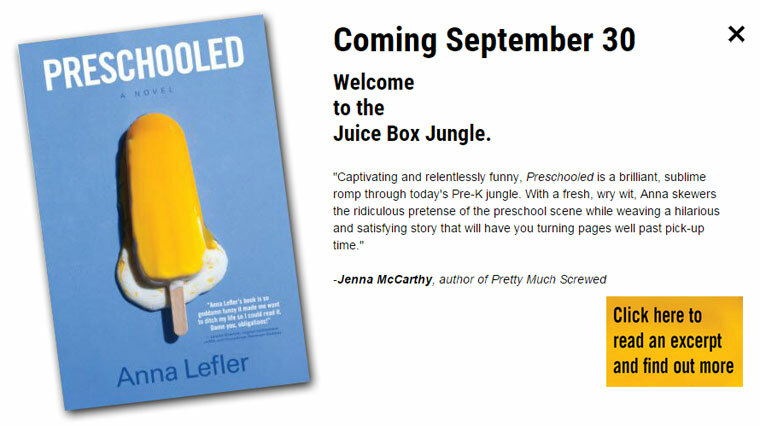 Why have you described preschool as the “Juicebox Jungle”? From a child’s perspective, preschool is a warm and caring institution where the focus is on kindness, sharing, and a loving appreciation of the world around us. From a parent’s perspective, however – especially a well-meaning but driven, achievement-oriented parent who’s used to excelling at everything they do – preschool can instead feel like a surprise parenting beauty pageant, where the judges are everywhere, and they’re throwing better birthday parties, volunteering longer hours, and consistently providing nutritious, earth-friendly snacks kids love to eat. “Juicebox Jungle” is a tongue-in-cheek nod to this seemingly innocuous environment that is, in fact, a source of real anxiety for many parents. 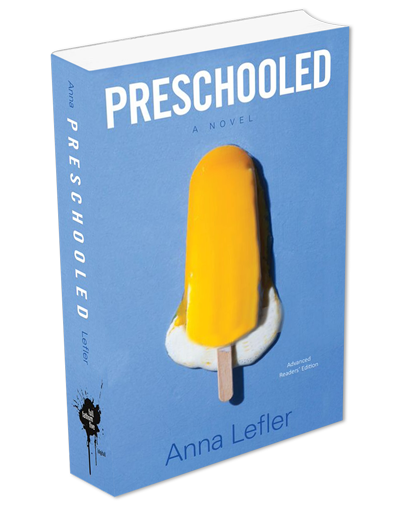 You have called this book “a love letter to my preschool years.” What do you mean by that? 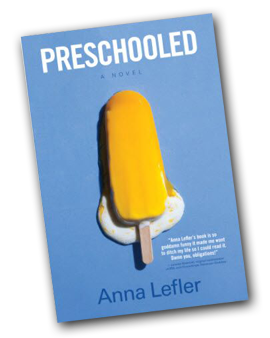 I’m the first to admit that I got sucked into the crazy L.A. preschool thing. Somehow my desire to do right by my kids turned into my being the mom who was sending out emails at one in the morning with urgent reminders to the Footie-Pajama-Day Committee. I mean, it got totally out of hand there for a while, but it came from a place of wanting to feel like I was doing everything I could to be the best mom I could be. And looking back at preschool now, I see that everyone was coming from that place. And although it turned into quite the Type A parenting melee at times, I find the scene very endearing in hindsight. Those were exhausting, humbling years, but I learned a great deal from everyone around me and I count myself incredibly fortunate to have those memories – and those friendships. Steve Martin and Carol Burnett are your comedy icons. How have they influenced you as a writer? I would say they both gave me a huge appreciation for the power of farce done with great intellectual subtlety, as well as a sharp, unexpected twist on social commentary invested with deep soulfulness. To me, they are both masters at the sublimely ridiculous that is not, in fact, ridiculous at its heart, nor is it ever mean-spirited. Their influence inspires me to go where I need to go – including down a hyperbolic or offbeat path – to say what I need to say. You write about “everyday triumphs and tragedies — the extraordinary in the ordinary.” How difficult is it to find humor in those times? Oh, I think we have to find humor in those times – both the ups and the downs – or we get lost in arrogance or despair. To me, the surprise twist of humor in a moment where it’s least expected is a truly magical thing – it reminds us that life is so much bigger than we are, that we’ll never truly understand it, yet we’re inseparable from its infinite, mysterious nature. I believe this is essential comfort for humans, both in good times and bad. Were you a funny kid? Well, I thought I was. Then again, I had a rich fantasy life. A review of report cards from my youth will reveal repeated occurrences of the phrase, “disturbs others around her.” I had my own little schtick that included a scathing send-up of Frau McKenzie (our universally reviled German teacher) and a disturbingly realistic impression of the mandolin tune from “The Godfather.” (Don’t ask.) Not material that would play in the main room, you understand – more of a cabaret-level act. What would you say to readers who, like Ruben, are aspiring humor writers? Speaking from my own experience, I would say to become very self-aware of the jokes you make and the funny observations that come to you. Chances are, you already have a comedic voice – the task is to take that starting point and work to refine it and expand it, all while gaining a clear understanding of your specific view of the world. Of course, the only way to do this is to sit down and take a stab at an idea you’ve been toying with – perhaps a short essay about something that matters to you? I recommend sitting in a café with a notebook and a pencil. (Somehow it’s easier to sneak up on yourself if there are no official electronics involved.) Settle in with your half-caf/half-decaf/almond-foam/choco-latte, tell your inner critic to cram it, and see what happens. Just make sure you tip your server well, because you’re going to be there a while…and you’re going to be back. Is it true you once smuggled a guinea pig onto a flight from DC to LA underneath your skirt? In my defense, I had exhausted all legal means of transport before resorting to an illicit caper. Also, it was an aggressively hideous peasant skirt, so in a sense I’ve paid my debt to society. Anyway, I was 15, the guinea pig was named Scooter, and there was no way I was moving to California without him. (The airlines classified him as a rodent, making him persona non grata on all commercial flights. #rude) The plan involved a pillowcase, my dad’s belt, and the aforementioned peasant skirt. I did not anticipate the pendulum-swing effect of the guinea pig hanging in a pillowcase between my knees as I walked through Dulles International Airport with my parents (who, I recall, were keeping their distance from me and looking up at the ceiling a lot). To stop Scooter’s swinging, which was causing him to emit an excited, high-pitched squeak, I made the rest of the cross-country journey with a fake limp that slowed my gait to a glacial pace – a limp that, in times of stress, can reemerge to this day.